क्षेत्रीय भाषाहरू The 72 languages and dialects of ethnic groups are also official in their regions. धर्म 86% multi-ethnic population (49% Mestizo and 37% White). 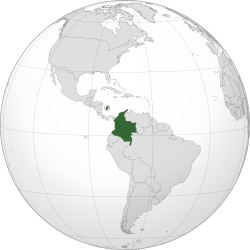 1 Although the Colombian Constitution specifies Spanish as the official language in all its territory, the native languages (approximately 88 dialects) are also official in the whole country. 2 The official Colombian time, (horalegal.sic.gov.co) is controlled and coordinated by the state agency Superintendency of Industry and Commerce. ↑ Consulta de la Norma. Alcaldiabogota.gov.co. Retrieved on 8 October 2012.